"You may have read in various astronomy forums on how one type of eyepiece "blows away" another type when observing the moon, planets, or double stars. In over 30 years of observing using dozens of eyepiece designs, the visual difference in planetary detail is subtle at best and only under extremely steady conditions can these differences be seen. Today's super widefield eyepieces certainly have their place but high quality Plossls or Orthoscopics with their minimum number of air to glass surfaces should be the rule for the planets. Make no mistake about it: If one is seeking the very smallest details on a planetary disc, only the larger aperture with its greater separating power can show them. In addition, the true colors of the planets become more apparent. Observing Jupiter at 300x with the resolving power of a 16" Newtonian in steady seeing is a sight to remember. It is no wonder that the finest images of the planets ever taken from the earth have been with large reflectors. Therefore, when one decides to purchase a telescope for planetary work, he should obtain the largest aperture he can afford. Furthermore, no expense should be spared in obtaining the finest primary mirror. Near perfect optics are available and are well worth the investment." The 10" PI250 instrument is first in our series of larger aperture Newtonians. Relatively light in weight and easy to handle, first class construction techniques, components of the highest quality, and the very best optics available combine to produce a telescope fully capable of remarkable performance. Constructed entirely of aluminum with stainless steel hardware, every attention to detail has been given to these fine instruments. Push-pull type primary and secondary mirror cells afford easy yet positive locking collimation adjustments. The tube ID is lined with black velevet. The result is a tube so dark, the primary mirror appears to be floating in space. To our knowledge, no other manufacturer of Newtonians incorporates this painstaking technique to extract the ultimate in image contrast. The light weight, high precision optics assure quick temperature equalization and will provide incredible detail on planetary subjects. The striking high gloss finish of the tubes combine with the "feel" of these telescopes will surely provide their owners with many years of satisfaction. These telescopes are not "run of the mill" mass produced instruments. Our telescopes carry higher prices due to the expense of utilizing only the very finest components. There is just no other way that we build them. Many amateurs have contacted us over the years complaining that their apochromatic refractors, although providing sharp, crisp images, just don't show them the ultra fine detail on Jupiter that they saw through a 12.5" Newtonian at a star party. Our answer to them has been simply that there is no secret here. As Dawes limit suggests, only the larger aperture can resolve the finest filamentary structures on a planetary disc. The 12.5" PI320, the 14.5" PI370, and the 16" PI400 round out our line of large aperture, high performance telescopes. These research grade instruments, due to their enormous light gathering and resolving power are capable of both deep sky and planetary performance only dreamed of and represent the ultimate in a personal telescope. Unparalleled optics and the highest quality components are employed throughout. The primary mirror cells of the 12.5" and 16" instruments are provided with a cooling fan as standard equipment. Energizing the cooling fan before an observing session ensures more rapid thermal equalization of the primary mirror to the outside ambient temperature. In fact, we recommend that the fan be run continuously while observing. The resulting laminar airflow significantly reduces the effects of tube currents early in an observing session. Although large in aperture, the 12.5" and 14.5" telescopes, weighing in at 55 lbs and 70 Lbs. respectively, may still be handled by one person due to its entirely aluminum construction. 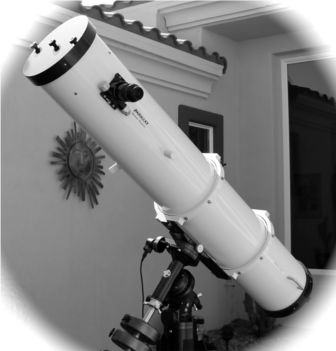 The 16" telescope is designed primarily for installation in a personal observatory and is also well suited for schools or universities. Our HD200 Equatorial mount is perfectly suited to handle these large telescopes.